Property 2: DOWNTOWN Studio # 1. King size bed. LOCATION, LOCATION, LOCATION !!! Property 4: Waves For Days Beach Front Condo! Panoramic Surf Views! Property 13: Cerritos Surf Villa At Cerritos Beach! Pool, Jacuzzi And Views Of The Surf! Property 18: Cabo San Lucas Condo w/Balcony - Right On Marina! Property 22: New Penthouse with Perfect Ocean View for a Perfect Vacation! Property 30: Margarita Casita at Cerritos Beach! Pool and hot tub! Walk to beach! Property 33: Penthouse Condo With Stunning Ocean And City Views. Three Bed, Three Bath. Beachfront Condo With Outstanding Views II ! Property 35: Beachfront Condo With Outstanding Views II ! Property 39: Endless Summer Luxury Surf Condo! Panoramic Surf Views! Beachfront complex! Our gem on the beach. Property 41: Our gem on the beach. Property 44: Safe, gated resort and spa 5 minutes to the heart of La Paz. Property 48: Charming 3-Bdrm Casa in Gated Complex with Pool-Walk to Town! The room was a very spacious two bed room condo with wonderful furnishings. All the amenities were there also, including a washer and dryer. What an awesome deck and great view. Copola is on the Quivira golf course, so it is actually 2.2 miles away from the Pueblo Benito Sunset Resort, where many of the restaurants and activities are located. So if you are going to use this condo to stay and still access the Sunset, I recommend you rent a car or be prepared to take a taxi back and forth, as the shuttle service provided by Copola to get to Sunset is not very reliable. Other than that, this location gives you soothing quiet and relaxation at your own pool, while providing access to the other facilities if you'd like to spice it up a bit. We enjoyed our stay and will definitely return again someday. My husband and I spent 11 nights here at Casa Tortuga. It was our second stay. It will not be our last. We are very fond of Misiones and very comfortable at Heidi's well appointed unit. 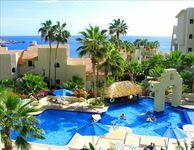 It is a beautiful and convenient setting for those who want a friendly and peaceful place to stay that is still conveniently located to downtown Cabo and other amenities. It has a great views of the Sea of Cortez that greet you upon waking for the sunrise. The Pool Bar and onsite market are very convenient. The unit is spacious and Heidi is an excellent host.